Learn Silbo Gomero - become a Silbador! 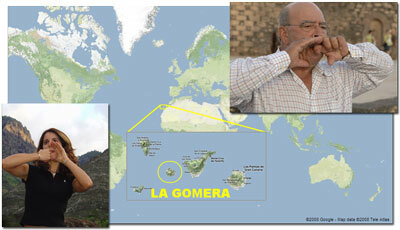 The existence of the whistled language of Silbo Gomero on the beautiful Spanish island of La Gomera has for years fascinated linguists and language enthusiasts alike. Silbo Gomero was invented in order to facilitate communication between the people of the island across the deep gorges and valleys long before mobile phones were invented. The tradition continues even now with the local government including it in the educational system of the island. busuu to the rescue of The Silbo Gomero! Silbo is a whistled language that allows speakers to communicate over large distances. The Silbo language came from North Africa with the first settlers who came to the Canary Islands. Now it has become an obligatory subject in all schools on the Islands. There are still places on the Islands where mobile phones don’t work, but Silbo never loses coverage! This ancient language is still solving the same problem it was invented to solve. When Don Isidoro was young, he had to leave his island home by boat to go abroad. His father was in another boat and from far away they continued to communicate with each other using Silbo. Watch the video to find out more. Maria is the biggest champion of the Silbo language. For her the language is at the heart of the island's’ culture. She hates that mobile phones have come to the island and have allowed people to communicate over long distances without using Silbo. She thinks that because of mobile phones there are not enough young people learning Silbo. José met his wife through whistling. It was love at first sound! She thought that he had a cute whistling voice, and they immediately hit it off. They don’t live in the same house any more, but they can still whistle to each other!